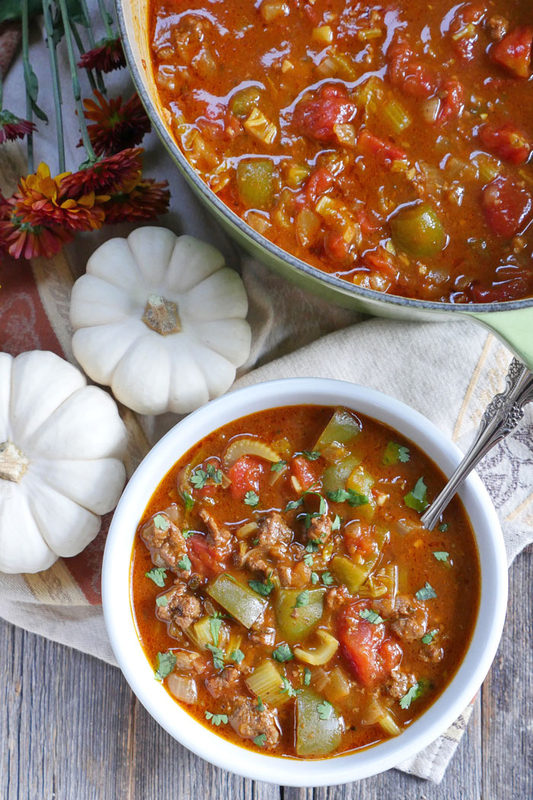 If you’re a chili fan like I am, then you will LOVE this meaty pumpkin chili. It’s the perfect recipe for fall! 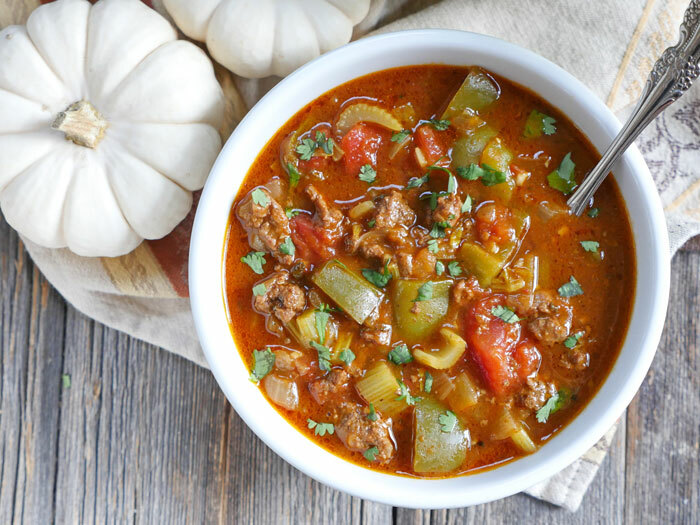 My recipe for paleo pumpkin chili is spicy and full of seasonal flavor: pumpkin pie spice and freshly grated nutmeg. It also calls for pumpkin puree. You can use fresh puree if you want, but to be honest, I prefer the convenience of canned organic pumpkin puree. 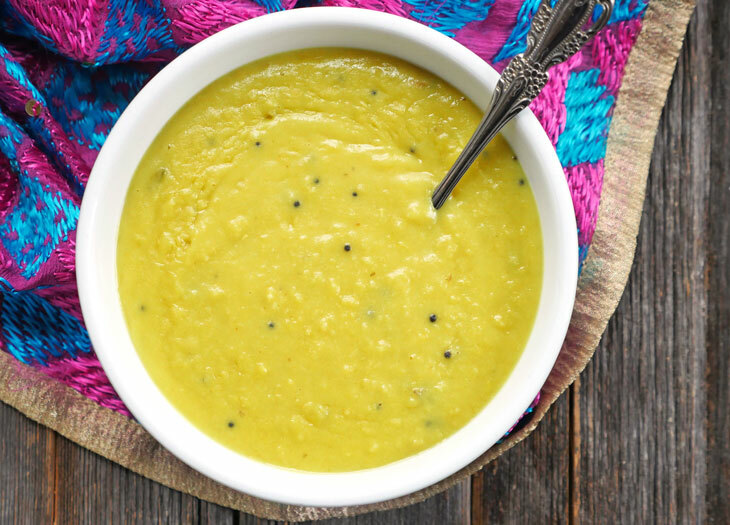 Even if you’re not a fan of pumpkin, I encourage you to try this recipe. Pumpkin is great because it doesn’t really have much flavor on its own – but it carries flavor really well. 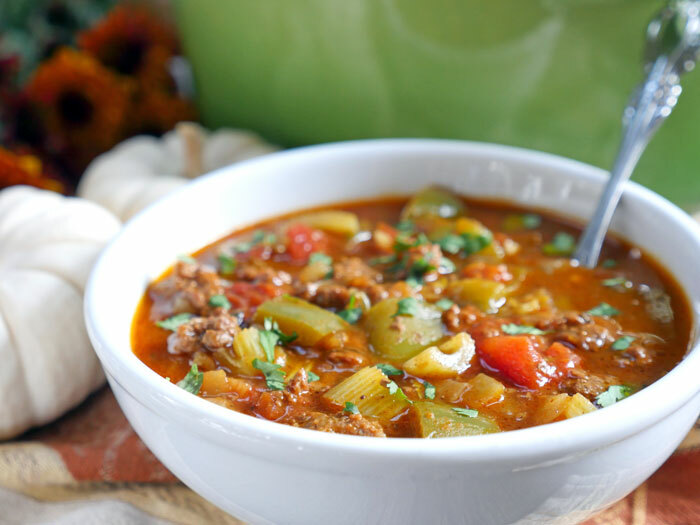 The purpose of adding pumpkin to this chili is to add a little thickness to dish. Plus, you get all the benefits that come with eating pumpkin. Like, extra fiber, vitamin A and potassium – just to name a few things. I think chili is one of my favorite things to eat this time of year. I make a batch almost every week. It’s so easy to make and fills the house with the best aroma! Plus, chili is a recipe that both Roby (my hubby) and I enjoy. I know Roby genuinely likes this recipe too because whenever I pack this for his lunch, he never “forgets” to take it with him. 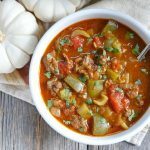 The first time I made this, I wasn’t sure what he’d think of pumpkin chili, because it’s different from my usual recipe – but he absolutely loved it! 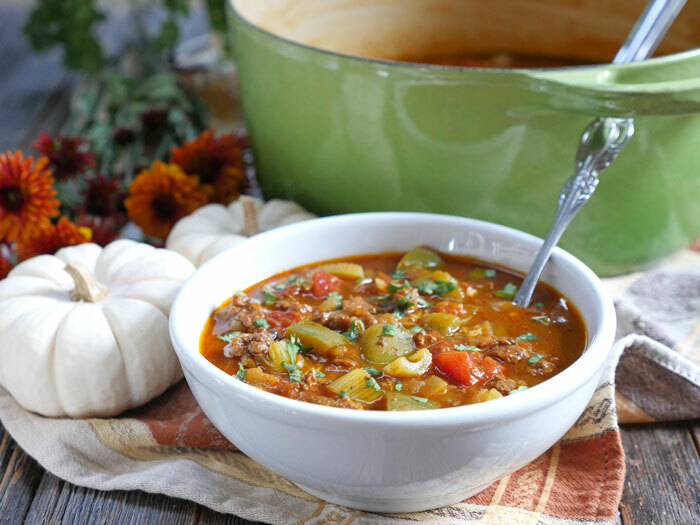 If you’re looking for a new chili recipe to make this season, I hope you try this! Add the oil, beef and onion to a dutch oven or heavy pot over medium heat. Once the beef has browned, add the remaining ingredients and stir. Bring the contents of the pot to a boil, then immediately reduce to low and cover with a lid. Cook for 45 minutes. 1. 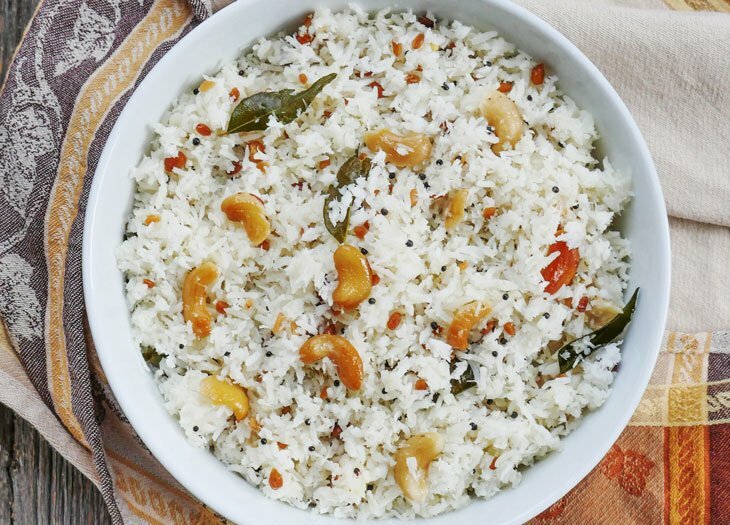 Would I be able to use my instant pot to make this? If so, any recommendations on time/etc.? I don’t have an answer to the instant pot question, but I’m doing a whole30 as well and made this tonight. I subbed in some unsweetened applesauce instead of coconut sugar, since thats what I had on hand. I used about a half a container (2 oz) and it came out great! Don’t know if it tastes any different, since I haven’t made it with coconut sugar yet, but the applesauce worked fine 🙂 Knowing that, some apple juice probably would work too! I can speak to the IP question- I’ve made chili in both the slow cooker function (8 hours) and the high pressure function – 30-45 min. The longer it cooks on high pressure the softer the meat and veggie texture (suitable for elderly parents). Definitely tastes better if slow cooked or 2nd day leftovers but cooking on the high pressure function still has tasty results and can’t beat it for quick homecooked meals! Can’t wait to try this pumpkin chili this week! Do you think you could use fresh tomatoes instead? I really want to make this tonight! I made this and added diced sweet potato and carrots. It was a hit! Even my kids liked it! Will definitely make it again!! I made this last night and it turned out really well! It was a bit spicy (but then again it IS chili) so I may cut back on the cayenne, but my boyfriend loved the spice level so there you go! Hi Sarah! Happy to hear that you and your boyfriend liked the chili 🙂 And, I completely understand – Rob and I are at two completely different spice levels which can make cooking a challenge sometimes. Glad to hear you’ll be making butter chicken soon! I rarely leave messages regarding recipes but twice now (at least) I MUST say something. WOW! Another good one. I was totally unprepared for taste. I love your website!! This looks great. I am vegetarian, so I will try it with seitan instead of beef.